Research on nonhuman primate vocal communication began about three decades ago when the first sound analyzing machines became available. Vocalizations recorded on tape could be displayed visually as sonagrams. They could be characterized acoustically in the spectral and temporal domain and the size and shape compared objectively. 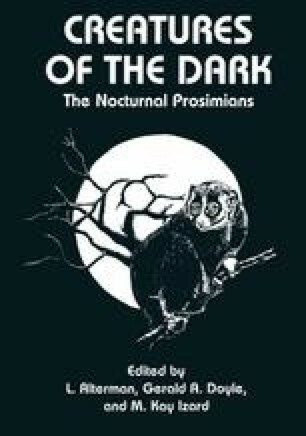 In 1963, the first sonagrams of nocturnal prosimians were published (Andrew, 1963). In the following decade, however, interest in the study of prosimian vocal behavior remained rather limited (Klopfer, 1977). Thus, it was not until 1979 that the first comparative survey of vocalizations in all of the main taxonomic groups of prosimians was presented (Petter and Charles-Dominique, 1979). Since then, sound analyzing and synthesizing techniques have become much more sophisticated. A significant amount of descriptive information on the structure and function of vocalizations of nocturnal prosimians has become available. Compared to simian primates, however, analytical and experimental studies designed to reveal information conveyed by the acoustic signals and their use in prosimian primates (messages and meanings as defined by Smith, 1977), as well as information about constraints and patterns in the evolution of their calls, are far more rare.